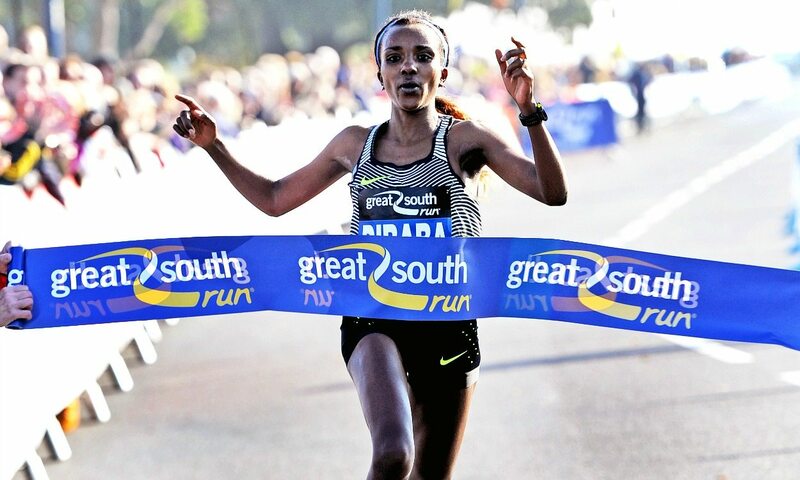 Tirunesh Dibaba was a dominant winner as she made her 10-mile debut at the Great South Run on Sunday (October 23), while Chris Thompson returned to winning ways on the roads of Portsmouth and Southsea. Clocking 51:49, three-time Olympic gold medallist Dibaba beat her fellow Ethiopian Senbere Teferi by more than a minute on a sunny and blustery morning, while Elizeba Cherono of Netherlands claimed a second podium place just a week after her Great Birmingham Run half-marathon win. Thompson, meanwhile, turned the tables on Andy Vernon, who had beaten him in Birmingham, clocking 47:23 to secure success ahead of his Aldershot, Farnham & District club-mate, as triathlete Matt Sharp finished third. With this being Dibaba’s last race for 2016, the 31-year-old had been keen to finish on a high note. After running with world 5000m silver medallist Teferi until around 10km, which was passed in 32:37, she pulled away when Teferi started to struggle with cramp and was never challenged. Teferi hung on for the runner-up spot, clocking 52:51, while Cherono was a further minute behind and crossed the finish line with 53:54 on the clock. “The run was good but it was a bit windy,” said Dibaba, who was returning to action after the calf strain which prevented her from racing at the Bank of Scotland Great Scottish Run earlier this month. Dibaba, who won the Great Manchester Run 10km in May on her return to racing following the birth of her first child and went on to place third in both the Rio Olympic 10,000m and Great North Run, now turns her attention to a spring marathon. Lily Partridge, who finished fourth in the Great Scottish Run half-marathon, was best of the Brits as she ran 54:41 for another fourth-place finish to also claim the title in the England Athletics 10-mile Championships. Rio Olympian Beth Potter followed her over the line in 54:57, while 2014 Euro Cross champion Gemma Steel was sixth in 55:18. Steel joined Partridge on the England Championships podium, along with Rio 10,000m 16th-placer Jess Andrews, who finished ninth overall in 56:20 after struggling with calf niggles during the race. In the men’s race, Thompson, Vernon and Sharp had formed part of a lead group of seven but at around the half-way point Vernon began to push the pace and after a 4:28 fifth mile the AFD athletes and Irish marathoner Paul Pollock began to create a gap. 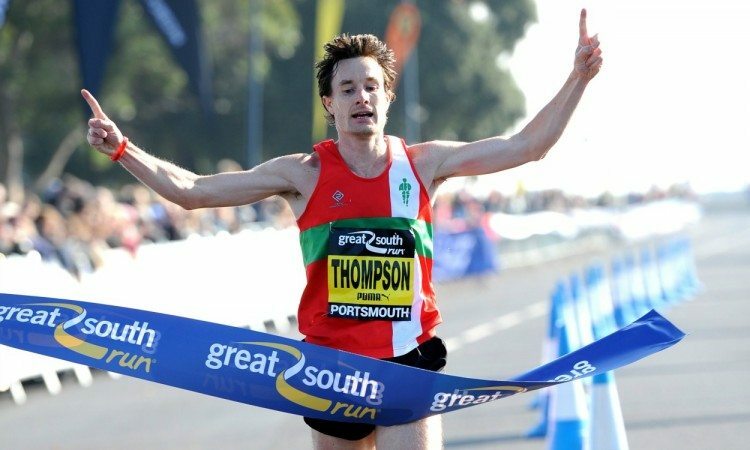 Feeling like he had plenty left heading into the final couple of miles along the seafront, Thompson surged ahead to eventually finish 46 seconds clear, with Vernon running 48:09. Sharp, who won the under-23 triathlon world title in 2011 but has switched his current focus to running, came through for third in 48:18 ahead of Pollock’s 48:21. USA’s Jeffrey Eggleston was fifth in 48:28 and London 2012 Olympic marathoner Scott Overall sixth in 49:07.